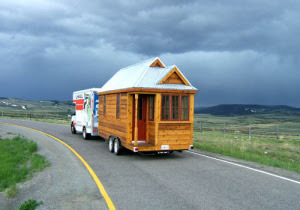 Oh Kenny......is this the tiny house you saw in Chicago? After living in a 322 sq ft home for almost a year, I could easily downsize to this without a problem. Tonight it's back to the dealership. On the upside, I did get a hell of a lot accomplished during the past few days. LOL....there is not a scrap of paperwork in sight! Silly is freshly bathed and I got the paperwork for Money Management International in order and ready to get mailed out today. I also found out that I won't be making any more money on inspections by doing them later in the day. People have all sorts of schedules and going to their homes late in the day does not guarantee them to be home and therefore getting higher pay. It only guarantees me to spend more time for the same money and the added cost of idling in the insane traffic we have here. Well....off to the UPS store and I hope I have more junk mail. :) Did I really say that?